Nigerian victim of human trafficking, Princess Inyang said helping the victims of trafficking is not enough but we must go to the root to solve the problem. 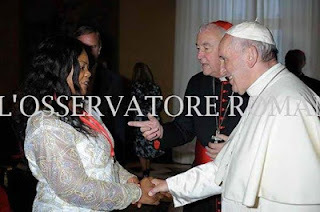 Inyang, along with two other victims of trafficking, Al Bangura and Crystal, shared their testimonies with Pope Francis during an audience between the Pope and members of the Santa Marta Group on October 27th. The Santa Marta Group is an alliance of international police chiefs and bishops from across the world who work together with civil society to eradicate human trafficking and provide pastoral care to victims. The group was launched by Pope Francis in April 2014 with the goal of developing strategies in prevention, pastoral care and re-integration through the international network. “When we are spending money only for the victims, more are coming (through trafficking), hearing the news that if you come, you have a place to stay, you have food to eat, you have clothes to wear, and you can go to school.” she said. Inyang herself became a victim of human trafficking in 1999, when she was promised that she would receive a good job in Europe as a cook, the job she had in her home country of Nigeria. But instead, she was trafficked. Her captors brought her through London and France and eventually to Italy, where she was forced into prostitution and to pay back her “debt” of 45,000,000 euros. She was eventually able, with help, to escape her traffickers, and has since founded the organization PIAM Onlus to help victims of prostitution. Inyang said there are several important root causes of trafficking in Nigeria which must be addressed. First, it is essential to break up the networks of traffickers leading from Nigeria through Niger and into Libya, and from there to Europe. One solution, according to Inyang, would be for the local government to establish farms and factories to employ young people. Another major issue Inyang identified is the lack of leadership and provision by fathers. Often, when a man has two or three wives, he has many children and ends up neglecting his family, she said. Because of this, it is frequently only the women who are working to support the family and there is not enough money. In his remarks, Pope Francis said that what is needed in the fight against trafficking is a concerted effort, effective and consistent, both to eliminate the causes of this complex phenomenon, and to meet, assist and accompany people who fall into the snares of trafficking.